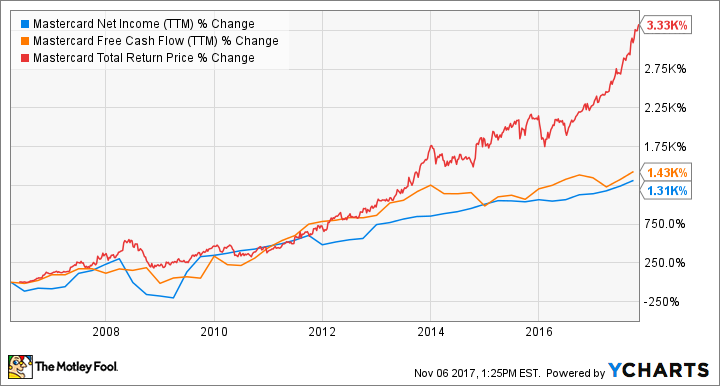 These three stocks are showing no signs of slowing down. Growth stocks come in all shapes and sizes. They can be established companies that are reinvesting massive amounts of their revenue into their businesses in order to fuel more growth, or they can be small players that are growing hand-over-fist while they build out their niche in new markets. Either way, these stocks offer significant opportunities for investors, and that's why we've asked a handful of Fools which companies they think are in high-growth mode right now and have lots more room to run. Read on to find out why MasterCard (NYSE:MA), Juno Therapeutics (NASDAQ:JUNO), and Shopify (NYSE:SHOP) meet those criteria right now. Neha Chamaria (MasterCard): MasterCard is a growth stock in every sense of the word. As a company that prefers to plow back a major chunk of its profits into the business instead of returning it to shareholders, MasterCard perfectly fits the definition of growth investing. As far as growth in earnings and cash flows are concerned, MasterCard leaves no room for complaints. The stock, meanwhile, has earned patient investors millions over the years. MA Net Income (TTM) data by YCharts. As incredible as MasterCard's journey has been, its growth story is far from over yet. MasterCard's biggest opportunity is just unfurling as nations across the globe gradually shift from cash to digital payments. For the payments processing behemoth that rules the world of credit and debit cards in a duopoly with Visa, populous countries like India that still depend largely on cash present a massive opportunity as the governments push digitization. As more and more transact using MasterCard's co-branded credit and debit cards, the company's revenue goes up. It's a simple, yet powerful business to be in. MasterCard's operating margin is already well above the 50%-mark, and all it needs is to invest in technology to expand the reach of its payments processing network while making it more secure. Management knows this well, which is why it recently extended its partnership with PayPal and has prioritized better security measures to win the confidence of the financial intermediaries and customers. With MasterCard just stumping the market with a solid set of third-quarter numbers, I'm even more confident that this high-growth stock is just getting started. George Budwell (Juno Therapeutics): The adoptive cell therapy company Juno Therapeutics has seen a massive surge in interest from investors lately, thanks to the recent clinical update for its lead CAR-T therapy, JCAR017. The big ticket item is that JCAR017's early stage results in patients with relapsed or refractory aggressive B-cell non-Hodgkin Lymphoma were exceptional from both an efficacy and safety standpoint. That's key because Juno's shares previously tanked after its former lead CAR-T therapy proved to be too risky to continue clinical trials, and the broader field of CAR-T therapies still have lingering questions about their own risk-to-reward ratios. So, JCAR017 appears to be capable of both grabbing a regulatory approval fairly soon, and becoming a commercially viable product due to its potentially superior safety profile. In other words, Juno isn't simply developing a so-called "me-too" product, but rather one that could become a market share leader in the years ahead. As an added bonus, Juno also sports a fantastic cash position for a clinical-stage biotech as a result of its collaboration with Celgene Corporation, and its recent capital raise. At the end of the third-quarter, for example, Juno reported a whopping $1.06 billion in cash and cash equivalents on its books, meaning that the biotech shouldn't need to dilute shareholders again anytime soon. All told, Juno's meteoric rise from the ashes appears set to continue as the company's lead CAR-T therapy inches closer and closer to a regulatory filing. Chris Neiger (Shopify): Believe it or not, the online retail industry is still in its infancy -- and that's great news for Shopify's e-commerce platform. The company offers cloud-based services to small and medium-sized businesses for everything from online sales, to tracking inventory and shipments, to helping businesses set up their own blog. Basically, if you're a small business that's selling anything to anyone then Shopify has a solution for you. Shopify's platform and services are compatible with Amazon, Facebook, and many other key online sales and social media platforms, which gives the company the ability to offer its customers lots of flexibility, while also providing Shopify multiple ways to bring in revenue from its customers. The company's top line jumped by 72% year over year in the third quarter, to $171.5 million, and Shopify's two revenue segments -- subscription solutions and merchant solutions -- increased sales by 65% and 79%, respectively. This fast-paced growth is being fueled by Shopify's massive customer base across 175 countries. Shopify skeptics will point out that the company is unprofitable right now, and that many of its customers are small businesses that may not make it. But investors should remember that the company is still very young and is firmly in growth mode right now. Consider that just two years ago Shopify had 200,000 merchants and now it has more than 500,000 -- an increase of more than 150%. Last year, U.S. consumers spent about $385 billion in online sales and that number is expected to spike to $632 billion by 2020. Shopify is tapping into this massive transition from brick-and-mortar retails sales to online sales by offering small and medium-sized businesses nearly everything they need to succeed -- and that should help continue propelling the company forward for years to come.